Even relative office-space bargains once found in older buildings in downtown Boston are drying up. It’s pretty clear that Boston’s office market is hopping. Now a pair of new reports illustrate just how high. Throughout Cambridge, for example, there are just three vacant office spaces of 20,000 square feet or more on the market, and rents in Kendall Square are averaging above $70 per square foot. Out along Route 128, vacancy rates are at record lows, while office rents along Interstate 495 are at seven-year highs. Those are just some of the highlights from the real estate brokerages Transwestern and Jones Lang Lasalle, which issued snapshots Tuesday of the regional real estate market for the second quarter. They showed that space is getting hard to find, and that building owners are reaping the benefits. Driven by strong employment gains and growing companies in need of additional space, rents are rising fast all across Greater Boston, up 7.6 percent in the last 12 months to an average of $32.53 per square foot, according to Jones Lang LaSalle. While hot markets such as Kendall Square are commanding premium prices, even relative bargains once found in older buildings in downtown Boston are drying up. In the second tier or so-called Class B buildings in Boston’s Financial District, rents are up 12.4 percent from the second quarter of last year, Jones Lang LaSalle said, pushing more companies to spots like North Station and Downtown Crossing. Chase Bourdelaise, director of research for Transwestern, said most downtown Boston markets are benefiting from businesses that feel they need to have an urban address. 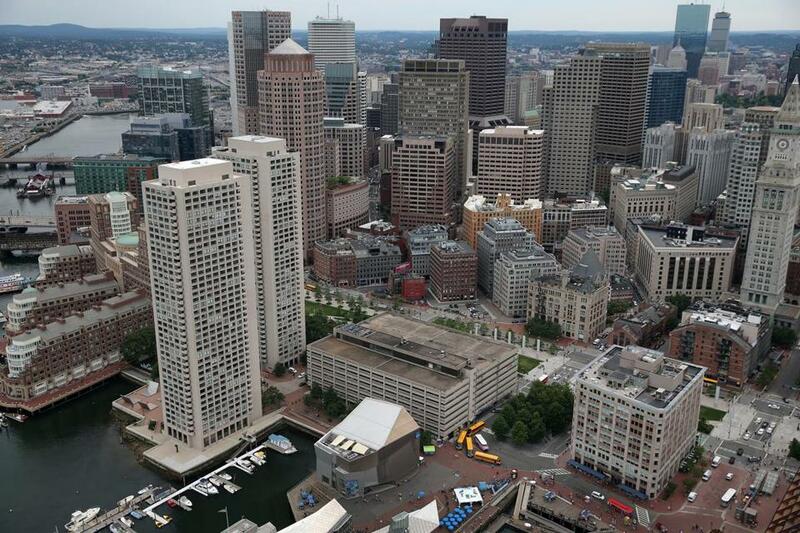 Beyond high rents, it’s a good time to own office space in Boston. Building sales continue to push postrecession highs, with $9.3 billion worth of deals in 2014. Many buyers come from abroad, like Quebec-based Ivanhoe Cambridge, which Tuesday announced it would buy the Channel Center in Fort Point from Beacon Capital Partners as part of a four-building, $225 million deal. Developers are furiously trying to get new buildings up; there are 4.9 million square feet of office space under construction around the region — and more than half of it is already leased, according to Jones Lang. Another high-profile groundbreaking is scheduled for Thursday, at 121 Seaport Blvd., where Skanska USA is launching a 425,000-square-foot office tower. All of which begs the question: How long can this last? Boston has been through booms before, after all, and wound up with a glut of empty office space, plunging rents, and fire sales. This time, though, feels different, said Lisa Strope, the New England research manager for Jones Lang. Boston’s economy continues to diversify beyond its traditional pillars of health care, education, and financial services, with its life sciences and technology sectors getting larger. She estimated the boom has at least another couple of years to run. “It’s very strong, but we’re not seeing the market overheat,” Strope said.